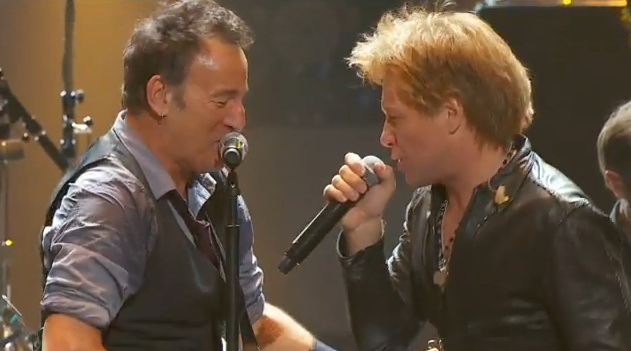 Bruce Springsteen & The E Street Band join Bon Jovi, Billy Joel, Alicia Keys, Paul McCartney, The Rolling Stones, Roger Waters, Kanye West, The Who and others at Madison Square Garden to benefit the Robin Hood Relief Fund’s Hurricane Sandy recovery efforts in the tri-state area. The concert is organised by the same group responsible for the 9/11 benefit "The Concert for New York City". The show is broadcast live via various channels around the world as well as webstreams. Bruce & The E Street Band open the show with a 30-minute four-song set that includes "My City Of Ruins" with a verse of "Jersey Girl" at the end. 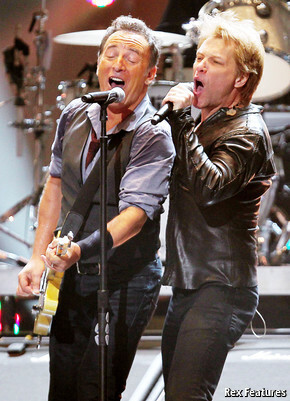 Bruce, accompanyies Bon Jovi on "Who Says You Can’t Go Home" from their 2005 album Have A Nice Day. 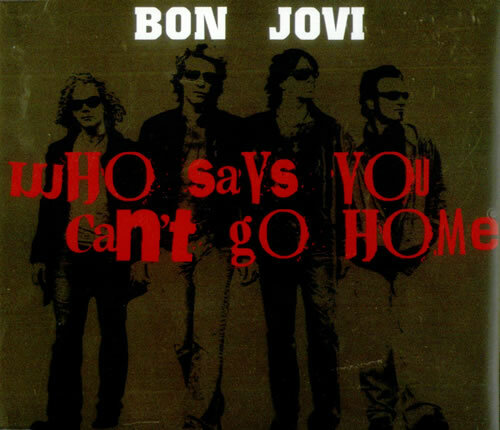 "Who Says You Can't Go Home" is a song by Bon Jovi, written by Jon Bon Jovi and Richie Sambora fort heir 9th album Have a Nice Day (2005). The song was produced by John Shanks, Jon Bon Jovi and Richie Sambora. A version of the song was also shipped to country music radio, featuring duet vocals from Jennifer Nettles of the duo Sugarland. The country music version was originally recorded as a duet with Keith Urban, who also played banjo on the song. After Jon Bon Jovi decided that Urban's voice was too similar to his own, he asked a representative of Mercury Records to recommend a female duet partner. The music video for the country/Jennifer Nettles version, released in November 2005 and directed by Jon's brother, Anthony M. Bongiovi, features Habitat for Humanity volunteers, including members of the Philadelphia Soul Arena Football League team owned in part by Jon Bon Jovi, building homes for low-income families and was used to promote the organization. It won an award for Best Collaborative Video at the CMT Music Awards in 2006.